I always liked Angel Dust with singer Dirk Thurisch and when the band broke up I missed them - especially their live shows. In 2003 Dirk Thurisch came back with Why?, unfortunately I missed that one due to facing a tough year. 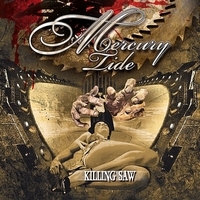 Now Mr. Thurisch is back with Mercury Tide and their new album Killing Saw. The intro In The Shame Of Trust slowly leads you into the album, the melancholy touch is enchanting you right away. The title track Killing Saw is a dark tune, the opening passage gets a Gothic touch due to the keyboard -  which btw reminds be of some Paradise Lost track... But then the tune becomes a riff-based rocker with a catchy refrain. At the guitar-based Home Thurisch's past shines through... Live this one will be killer! Searching is an up-tempo rocker with a hard rock edge. Then they slow down for awhile which changes the atmosphere of the song. Then they speed up again. A quite catchy tune with a memorable riff. The balladesque World Of Pain is right up my alley! Slowly guitar takes you into this one, but it's Dirk's vocals which do the trick. For awhile they get heavy but stay melodic, back to the opening theme... A sonic roller coaster ride. One of the catchiest tunes is Satan Sister, but with the heavy riffs they stay safe from becoming soft. The closer Have No Fear is crossing the border to hard rock... A balladesque ending of this chapter. Mercury Tide manage to present a homogenous album and to keep the listeners interest with tempi-changes, creating atmospheric parts and varying in general. In my opinion Dirk Thurisch's vocals are the strong point. Another asset is that the songs are memorable without getting gimmicky catchy. Any two can win you over! And hopefully it won't take too long til be hear from Mercury Tide again!